Competition in the SSD space has erupted of late. Back in March of 2009, spinning-platter hard disk behemoth Western Digital signalled its intentions when it acquired SiliconSystems. 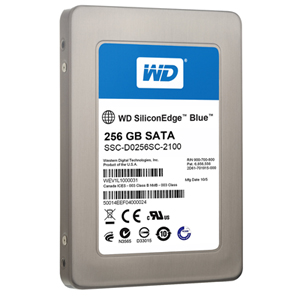 The first product of the acquisition gracing consumer systems is the WD Silicon Edge Blue SSD. Available in 64, 128 & 256GB varieties, it boasts claimed specifications of up to 250MB/s read and 170MB/s write, with a 1.4 million hour mean time between failure (MTBF) rating that suggests you should be long dead before your precious data is. According to Anandtech, the drive is based on Jmicron’s JMF612 controller, with 64MB of DDR2-800 for cache. 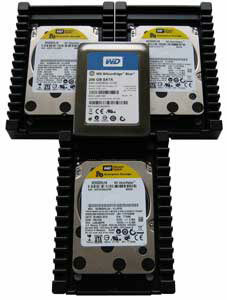 Western Digital don’t specify a seek time, but as with other SSD’s it’s measured in micro, not milliseconds. 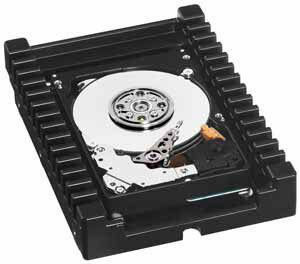 Western Digital’s VelociRaptor series has been covered on OCAU before, but in case you missed out, or in case you’re new to enthusiast grade storage, it boasts a 10,000 RPM spindle speed, 3.6ms seek times and a 32MB cache. The difference for this article is that the VelociRaptor will get help from an identical twin or two, in RAID-0 setups of two and three drives. Finally, for the user that isn’t satisfied with a fancy new SSD or voluminous RAID: you could always try a RAM disk. Sure, it’s volatile memory (meaning it will disappear when the power goes off), and it makes SSD’s dollar-per-gigabyte equation look frugal, but the speeds are an order of magnitude faster than any secondary storage on the (consumer) market. Kingston kindly lent one of their 16GB kits – the KHX1600C9D3K4/16GX. Will the SSD simply obliterate everything? Can the RAID-0 arrays claw back an expected performance deficit? Can a RAM disk prove a wise choice? Read on to find out. Crysis: WARHEAD displays the level load time in the games console, all other tests (except HD Tune) were timed with a stopwatch. All tests were repeated 3 times and averaged. The RAM disk was setup with DataRAM’s RAMDisk software. It’s free for disks up to 4GB and for US$9.99 the unlimited version is pretty good value.